Barack Obama supporters in the UK. A lot has happened this week, both locally (a great Democrats Abroad health care celebration!) and back home (Justice Stevens is retiring!) but I wanted to take a moment now to write about the economy. 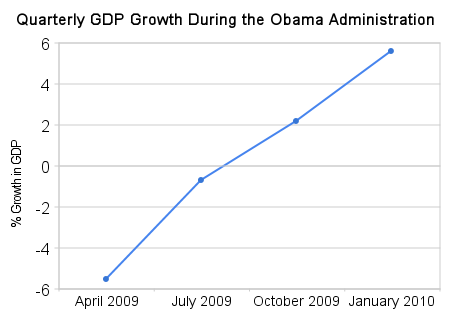 Specifically, the improvement in the economy. Little more than a year ago, financial markets were in turmoil, major auto companies were on the verge of collapse and economists such as Paul Krugman were worried about the U.S. slumbering through a Japan-like Lost Decade. 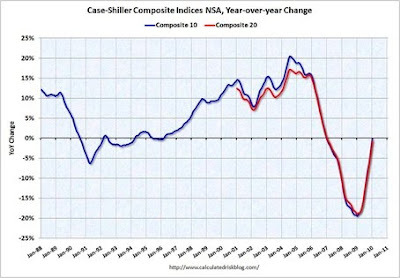 While no one would claim that all the pain is past or the danger gone, the economy is growing again, jumping to a 5.6% annualized growth rate in the fourth quarter of 2009 as businesses finally restocked their inventories. The consensus view now calls for 3% growth this year, significantly higher than the 2.1 % estimate for 2010 that economists surveyed by Bloomberg News saw coming when Obama first moved into the Oval Office. The U.S. manufacturing sector has expanded for eight straight months, the Business Roundtable's measure of CEO optimism reached its highest level since early 2006, and in March the economy added 162,000 jobs—more than it had during any month in the past three years. "There is more business confidence out there," says Boeing (BA) CEO Jim McNerney. "This Administration deserves significant credit." It is worth stepping back to consider, in cool-headed policy terms, how all of this came to be—and whether the Obama team's approach amounts to a set of successful emergency measures or a new economic philosophy: Obamanomics. But this doesn't need to be a question of interpretation. The facts on the ground are very clear - on almost every measure, bar unembployment - which is only just starting to recover, with our first month of positive jobs news just reported - the economic situation has grown better under Obama's presidency. 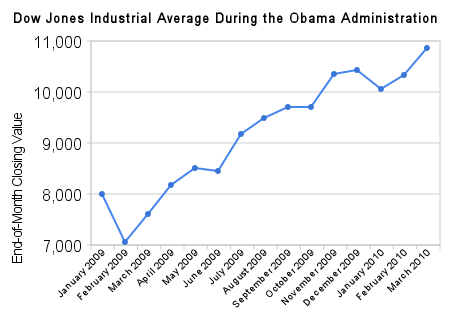 I'm going to just flagrantly steal some charts from Ezra Klein's blog, but as usual you really should read it yourself. This is fun. I could do this all day. Now, the news is not all unmixed joy. It's true that in order to achieve these results, Obama has allowed the deficit to continue to rise (worth noting that the biggest chunk of the deficit still came under Bush - but also worth noting that Obama CHOSE to let it continue going up). that the deficit would also have continued to go up if the economy (e.g., GDP growth) had failed to grow, since tax revenues would have continued to plummet. I find all that convincing. There's another point as well - it's possible Obama was just plain lucky. Maybe he just happened to be inaugurated at the peak moment of the recession and it would have naturally turned around even if he had done nothing. I don't think that's the case, and there's plenty of evidence to suggest that the direct job creation and protection (a lot of firefighters and teachers were due to be laid off without the stimulus) led to real growth. But it's theoretically possible. 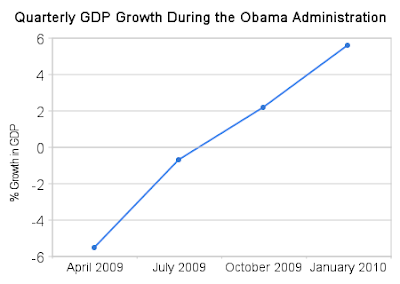 What I DON'T think you can now argue, even as a hypothetical, is that anything Obama and his team did in any way slowed down of prevented a recovery. So the source of the anger and economic populism that springs from much of the right appears tome (how shall I put this delicately) to spring from factors other than a purely fact-based analysis. Gordon Brown meets with the Queen tomorrow to ask for a general election to be called. Yes, that's really how this works, the mad compromise with history that is political life in Britain remains as entertaining as it is, oddly, more or less effective. But in the competition to determine who our next Prime Minister will be, may I only issue a fervent and heartfelt: May the best man win. In terms of our relationship with America, I feel confident in saying that Obama's relationship with a future PM will be the same as his dealings with the current one; a warm and close association in which we don't always agree but most often find ourselves on the same side. Call it a Special Relationship if you like - and the British Media love to check the pulse and temperature of the Specialness in our relationship, viewing it apparently as a very poorly patient. For me the point is that in the BEST of all possible ways America doesn't usually need to worry about Britain. We rarely worry that they will stockpile nuclear weapons, or crack down in totalitarian oppression against their own people. We don't worry that they'll mass troops against their neighbours, or intentionally destabilize global currencies. If Obama often doesn't spend as much time on the relationship with Britain as the British press would like, it's because there are a lot of countries out there for whom one or more of those descriptions apply. That the UK is so often proudly unproblematic is something that (fortunately) is unlikely to change no matter which of the candidates becomes our next PM. So I don't expect Barack will be rushing to endorse any of them, whereas I do expect he'll be quick to congratulate whoever should come out ahead. Which doesn't mean there won't be offices in the White House - including the Oval one - watching the forthcoming show with great interest. Vote From Abroad - Register to vote!